With over 400 sessions on the official program, this year's World Economic Forum ended with 50 projects aimed to support the UN Sustainable Development Goals. It was heartening to see the global commitment from businesses to use economic activities for the best of society and the planet. SYSTEMIQ teams were in Davos to launch three publications advocating innovation in the waste management systems, economic feasibility of the Sustainable Development Goals and investment opportunities for a circular economy. By 2050 there could be more plastic in the sea than fish. We quickly need to redesign plastic material and improve waste management systems. The New Plastics Economy initiative led by the Ellen MacArthur Foundation and the World Economic Forum brings together 40 governments and mayor businesses from the plastic industry and beyond. The initiative thrives to increase global reuse and recycling rates for plastic packaging from ist current 14% to 70%. SYSTEMIQ provided analytical support for the study. The Sustainable Development Goals will play a mayor role in providing prosperity for all. 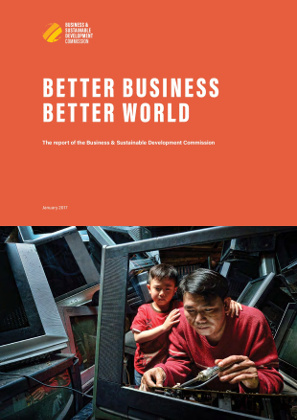 The report "Better Business, Better World" identifies 60 sustainable and inclusive market "hot spots" which can generate immense economic growth if businesses commit to the Sustainable Development Goals. SYSTEMIQ provides strategic content and secretariat support for the Business Commission of Sustainable Development. Scaling the circular economy in Europe offers investment opportunities totaling €320 billion. The circular economy provides attractive opportunities for businesses to build resilience and growth through innovation in product design, business models, resource flows and value creation. Furthermore, circular economy principles offer a new lens through which to assess investments and mitigate the risk that assets will become ‘stranded’ as markets are disrupted by digital technologies, and prices are increasingly required to reflect the environmental and other costs of business activities. The report was written by SYSTEMIQ in collaboration with the Ellen MacArthur Foundation and sponsored by the SUN Foundation.